One day the garage door works just fine and on the next - it is completely stuck. Don’t get frustrated if this happens to you. Take action to fix the problem before it gets bigger. These small devices are connected via an infrared beam when the door is closing. If the beam is interrupted by a person, animal or any object, the opener reverses the door. When the sensors don’t work the door will keep reversing when you attempt to close it with the remote. The simple troubleshooting involves cleaning and aligning the devices. If this doesn’t help, they should be replaced in the fastest possible way. Once the new sensors are set in place, a test will reveal if they work properly. Why do tracks bend in the first place? Loosening, misalignment, obstruction are all possible causes along with improper setting of the cables or the tracks themselves. Generally, the thinner these components are the more likely they are to get bent. There are straightening techniques for restoring the condition of the tracks. Often, the bolts of the brackets have to be tightened as well. If a track is severely bent and close to breaking, replacement is the more effective and cost-efficient solution. The job of this spring, which is mounted over a shaft, is to keep the door balanced. To do this, it must be loaded with a specific amount of energy corresponding to the weight of the door. This is achieved with the winding of the spring during its installation. With time, the door can get heavier or lighter especially on a seasonable basis. The spring can have too little or too much tension to keep it balanced. This will make opening and closing much more difficult. The solution involves adjusting the tension through winding or unwinding. When the motor runs as usual, but the door doesn’t open, the trolley may be responsible. This component moves along the track with the help of the drive chain, belt or rod. It is connected to the door via a moving arm. This is how the motor is able to open and close the door. When the trolley is broken, it may move, but door will remain in place. The only solution to the problem is the replacement of the component with a new one of the same type and design. Worried about your malfunctioning automatic door? Count on us to fix it. 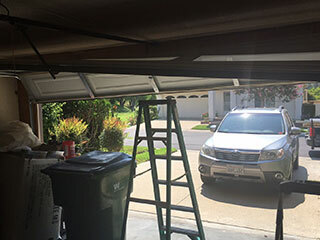 Our company offers a full array of garage door repair services covering the openers, all hardware parts and the panels. Let us know how we can help. Give us a call or leave a note. To find out more about us at Garage Door Repair Sun City West, go over our website.